Ah, how I long for the days when living was cheap and work was optional; when the family could comfortably survive on dad’s salary and mom could stay at home with the kids until she felt ready to go back to work. Or then again, perhaps I don’t – I love my work and can’t bear the thought of staying away from it for years at a time. Whichever camp you fall into, going back to work before our babies (or their mothers!) are ready to stop breastfeeding is a reality for most women in the 21st century. 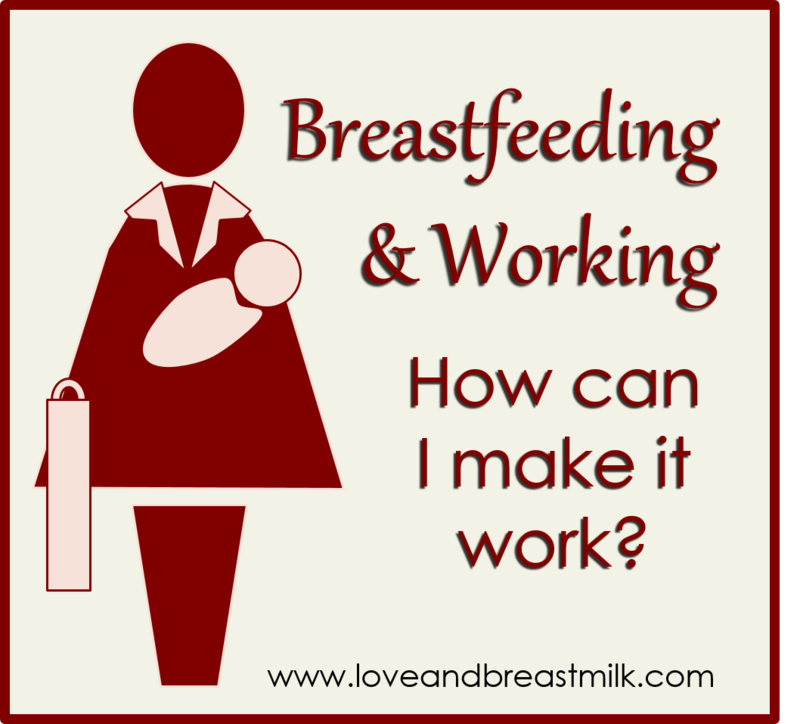 Whether it’s financial pressures or a love of our careers that’s pulling us back into the workplace, thousands of women are left trying to figure out how to make breastfeeding and working… well, work! The good news is that help is here. Millions of women have done this before you, and millions more will. You can become part of the story. At this point, conventional wisdom states that I need to start talking about pumping. But I’ve found that the biggest challenge was not to get the milk to feed my baby, but to make peace with it in my own heart. So, for that reason, I want you to read the following sentence until it sinks into your heart: you are not a bad mother. Having to (or wanting to) go back to work does not make you a bad mother. If it so happens that your baby gets a mix of formula and breast milk because you struggle to express enough, it does not make you a bad mother. What makes you a good mother is love, not breast milk. So please, please, please: decide that you will do the best you can to meet your own goals; but promise me that if things don’t work out that way, you won’t beat yourself up over it. Before you go on maternity leave, talk to your employer about what will happen when you come back to work. Tell them that you plan to breastfeed, and that you don’t intend to stop just because you are returning to work. If you can negotiate breaks and space for pumping (or whatever you feel you need) before the time, it will take a load off your mind. To help make your case, you can print out our letter and give it to your boss, HR and everyone else who might have a vote. If your employer is not willing to meet you halfway, remember that you have certain laws on your side. Many employers have never had to deal with a breastfeeding employee before, and a bit of education can often go a long way! If you are going to be pumping, hold off on buying a pump until you’re actually lactating. If possible, borrow a few pumps and try them out to see what kind of pump you respond best to. There’s nothing worse than spending several thousand bucks on a fancy electric pump, only to discover that you can only get milk out by hand expressing! Okay, now we can start to talk about the technicalities. There are plenty of ways to keep giving your baby breast milk while you work, so we’ll do a quick run-through of them all. Pump at work to provide milk for baby to drink while you’re away. Basically, while other babies at day care may be getting formula, yours will be getting mommy milk. This is what most women do, so I’ve written a whole separate post about it here. Go home to breastfeed during breaks. If your baby’s day care is close to your workplace, you can negotiate with your boss that you use your lunch hour, tea breaks and/or pumping breaks to go breastfeed your baby. It sounds like a far-fetched theory, but if you work within a five-minute drive of where your baby is it can actually work really well. A good friend of mine did this for over a year – and she works as a therapist in a hospital! If your workplace has an onsite crèche, it makes your life just that much easier – you can simply go breastfeed at work! Take baby to work. Now obviously, there are some professions where this is not possible (bringing baby to the police station or to the restaurant kitchen is not a good idea!) But for certain kinds of work it is quite possible – say if you do private domestic work or telemarketing. Work from home. This needn’t mean that you start a home-based business, but see if you can negotiate some telecommuting hours for your job. Again, this will only work in certain kinds of jobs, but you never know until you ask! Sometimes the whole breastfeeding and working thing just doesn’t go as smoothly as the textbooks would like you to believe. Some women, for instance, just never manage to express breast milk, even though they have more than enough in the breast – there’s no shame in that! Or sometimes the pressures of the workday just don’t allow enough time for pumping. Or perhaps your already shaky milk supply just can’t keep up once baby is no longer drinking from the breast all day. In all these cases it’s simply not possible to keep giving breast milk exclusively, and formula is going to enter the picture – usually along with a truck-load of guilt and well-meaning but unwelcome advice. Here’s the thing: breastfeeding is not an all-or-nothing proposition. Yes, exclusive breastfeeding will always be the best for your baby, but any amount of breast milk is far better than nothing. Read that again: any amount of breast milk is far better than nothing. So even if you stop breastfeeding completely on the day you start work again, your baby still has a huge head start from all those weeks of breast milk goodness! If pumping doesn’t work for you, but you’re not ready to say goodbye to breastfeeding completely, then how about a compromise: switch to formula during the working day, but keep breastfeeding while you and baby are together at night and on the weekends. Your breasts will quickly figure out the rhythm and adjust their production so that you don’t get full and sore during the day, but there is still enough milk when baby wants to drink. In my own case, I stopped pumping when my son was one year old (because I just don’t enjoy it at all! ), but we still kept breastfeeding for many years (yes, years) after that. So the end of pumping doesn’t have to mean the end of breastfeeding – unless you want it to. A final caveat to this section: If you are an HIV-positive mom with an HIV-negative baby, you should never, never, never give a mix of formula and breast milk to a baby under 6 months old. Never. Mixed feeding under 6 months is the quickest way you will give your baby HIV – it has to be either all breast milk or all formula. If you started out exclusively breastfeeding and honestly aren’t managing to keep it up while working, you will need to make a complete switch to formula. And give yourself a round of applause for all the weeks or months of breastfeeding that you managed! This was actually the first post I ever wrote for this blog. As a mom who loves breastfeeding but also loves her job, it’s a topic that’s very close to my heart. I see moms on the maternity ward every day who tell me “I can’t breastfeed because I need to go back to work,” and it always gives me such pleasure to tell them that, actually, you can – even if it’s only until you go back to work. Some women are glad to hear it and others don’t want to go to all that trouble, and that is also fine – but I want every woman to have all the information before she makes that decision. Knowledge, as they say, is power, and that’s never truer than when you are breastfeeding!